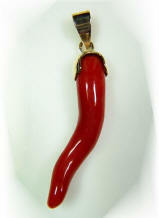 One-of-a-kind, 18KY pendant with rare, large, untreated, Mediterranean ox-blood coral. No reserve. 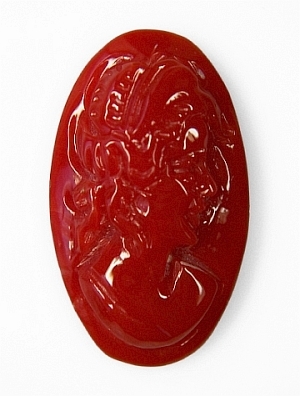 Statement jewel, large & rare, 18KY gold, granulated, "art deco" inspired, astrological red coral | Mars pendant, 37mm long x 20mm wide, 3.05 grams of gold, showcasing a rare, untreated, Mediterranean ox-blood coral, weighing 11.27 cts., masterly executed, oval cabochon cut, and measuring 20.08 x 15.04mm, clean surface with mirror finish, from the Southern Sardinian Sea, Mediterranean basin. The bail has 2 clean and white, full cut, natural diamonds, of 4 points total. Beautiful, rare large face, more like a 20 cts. piece, with fine ox-blood color and clean surface make this red coral, Vedic jewel a must have for someone that understand nowadays rarity and auspicious beauty. Alluring, perfect piece, untreated, Mediterranean Vedic, ox-blood coral. 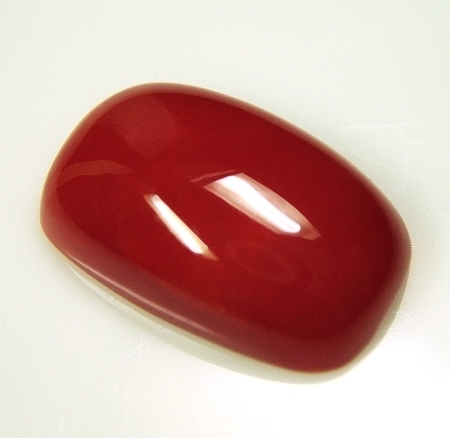 Absolutely top, ox-blood red color in this untreated, Mediterranean red coral, weighing 4.26 cts., perfectly executed, oval cabochon cut, and measuring 14 x 10mm, clean surface with mirror finish, hailing from off the coasts of Alghero, North-Western Sardinia, Mediterranean sea. Needless to say, color this fine is very difficult to obtain. In addition, cut perfectly and with pristine polish. 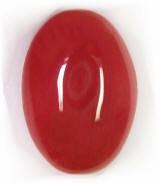 A fine, untreated, Vedic red coral that will be auspicious in your life. Rare quality, very beautiful & perfect, untreated, Japanese Aka red coral. Something nowadays rare, an untreated, Japanese red coral, which is called Aka in the trade, weighing 7.88 cts., fine, ox-blood red color, perfectly executed, antique cushion cabochon with flat bottom, measuring 16.50 x 10.36 x 5.44mm, clean surface with top mirror finish from the Japanese Sea. Classic example why carat weight should not be your main concern in determining price. For someone desiring the allure and auspicity of what is considered the best origin coral available to propitiate Mars. Auspicious, uniquely beautiful, well crafted, 14K yellow gold "Moon & Mar's talisman for Jyotish & Vedic astrology. A beautiful & auspicious, 14K yellow gold, " Moon & Mars" talisman for Jyotish & Vedic astrology, this well crafted, double pendant is 39mm long and 12mm wide, and showcase a pristine South Sea pearl, natural light yellow color, weighing 5.23 cts., perfectly round @ 9.1mm, with great luster and clean surface, from the Philippines Sea. The below, untreated, Mediterranean, Sardinian red coral weighs 4.00 cts, fine ox-blood red color , measuring 14x10mm oval cabochon, clean surface with mirror finish, hailing from off the coasts of Alghero, North-Western Sardinia, Mediterranean sea. Sturdy and well made, 14K yellow gold pendant, this wears very well, unique and guaranteed to last you a lifetime. 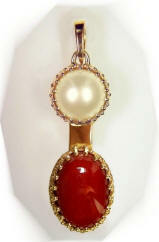 Lovely all the way, this 14K yellow gold, untreated coral "corno" pendant weighs total 8.26 cts. (the coral itself is 6.39 cts. ), measuring 39mm long (1.5 1/16") including the bail, featuring an untreated (not dyed and not polymer filled), free form Mediterranean ox-blood coral, with clean surface and fine high polish surface, hailing from off the coast of Western Sardinia (Alghero), Mediterranean Sea. The "cornuto", "corno", or "cornicello" is an Italian amulet of ancient origin. "Corno" means "horn", and this name refers to a long, gently twisted horn-shaped amulet worn in Southern Italy to protect against the evil eye. Nice pendant to enhance the power of Mars. 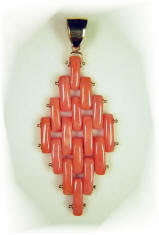 Another very lovely, 14K yellow gold, untreated coral "corno" pendant, total weight 8.36 cts. (the coral itself is 6.79 cts. ), measuring 37mm long (1.5") including the bail, and featuring an untreated (not dyed and not polymer filled), free form Mediterranean ox-blood coral, with clean surface and fine high polish surface, hailing from off the coast of Western Sardinia (Alghero), Mediterranean Sea. These are the last remaining of a popular pendant that wears well and unique. Great price here. Uniquely gorgeous, well crafted, 18K yellow gold, flex rhomboid with very rare Sciacca, volcanic pink-orange coral. An unique & rare, 18K yellow gold, Italian made, Sciacca coral pendant, approx. 23.50 cttw. of Sciacca coral and 1.3 grams of 18KY gold, measuring 69mm long x 29mm wide (2.75" x 1.15"), excellent and clean surface on this connoisseur coral from off the coast of Sciacca, Sicily. Sciacca coral, which is nowadays super rare because strictly protected and sporadically available, is a coral of volcanic origin and prized by worldwide collectors for its unique orange-pink color. 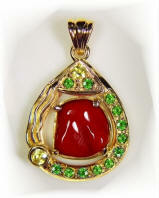 This gorgeous pendant is well made & very flexible due to its "Rolex oyster" design and adhere very well to the skin. Great & rare find. Ideal for ladies that need a gentle "Mars" boost or want to be unique. Unique, well crafted, 18K yellow gold, flex rhomboid with untreated Mediterranean ox-blood red coral. 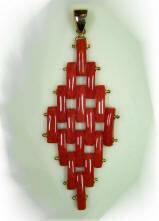 An unique and very beautiful, 18K yellow gold, Italian made, Sardinian oxblood coral pendant, approx. 17.50 cttw of untreated, ox-blood coral, with 1 gram of 18K yellow gold, measuring 63mm long x 24mm wide (2.5" x 1"), good & fair surface on the coral, hailing from off the coasts of Alghero, North-Western Sardinia, Mediterranean sea. 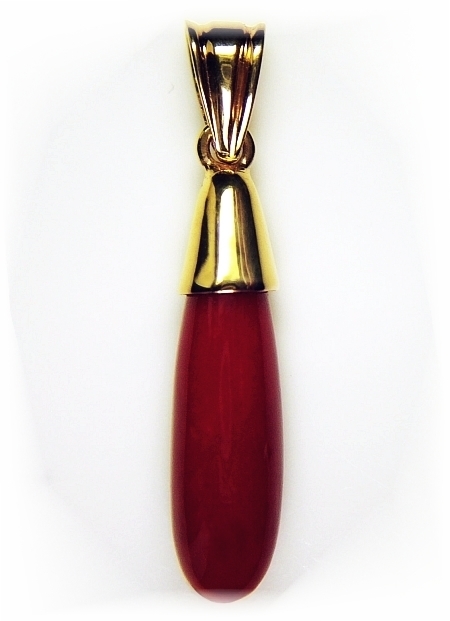 Unique and exotic pendant in the shape of a rhomboid and crafted in the "Rolex oyster", flexible style, in the sought after and rare ox-blood color. Only one in this fine color and offered at a great price. Set yourself apart. 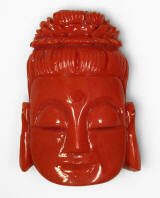 Very lovely, great size with large face, untreated, Vedic red coral. You have finally found your trusted source for fine, astrological Jyotish gemstones and Vedic planetary talismans. 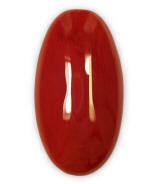 This Vedic, untreated, Mediterranean red coral weighs 8.73 cts., good medium, ox-blood red color, perfectly executed, oval cabochon cut, and measuring 18.03 x 12.80mm, clean surface with mirror finish, hailing from off the coasts of Alghero, North-Western Sardinia, Mediterranean sea. 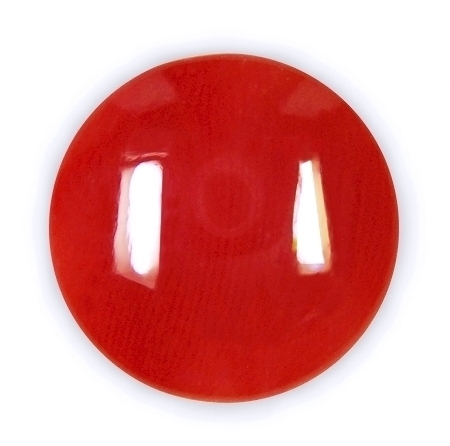 This is a calibrated 18 x 13mm untreated, not dyed & not polymers filled, Mediterranean red coral, that is ready to be easily set in our elegant "crown" pendant. Very hard to get material for its size and fine quality. Do not settle for lower quality and higher prices with our competition. We are the source. Alluring, very well shaped, untreated, fine oxblood, Mediterranean red. 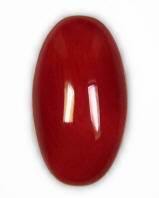 Another great, untreated, Mediterranean red coral with the rarest & famed oxblood red color. It weighs 4.50 cts., fine, medium-dark, oxblood red color, very well executed, elongated, oval cabochon cut, measuring 17.10 x 9.30mm, clean surface with mirror finish, hailing from off the coasts of Alghero, North-Western Sardinia, Mediterranean sea. 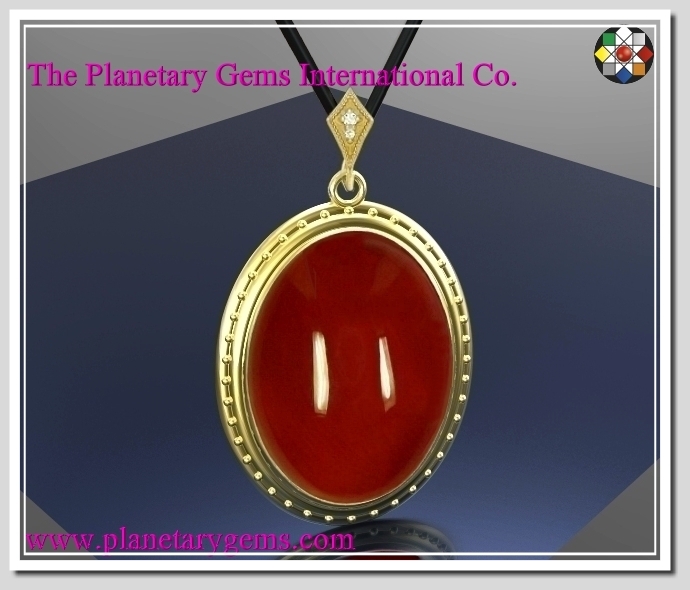 This is a gorgeous red coral piece that is sure to make a an alluring custom jewel to propitiate the favors of Mars. FYI, the whitish lines you see in the pic and in other pics of our corals are just the reflection on coral's surface of the lightning we use to photograph the pieces. Rare finest oxblood red color, truly lovely, untreated, Mediterranean red coral. A most gorgeous and rarest color, untreated, Mediterranean red coral, weighing 4.40 cts., finest oxblood red color, well executed, oval cabochon cut, and measuring 14 x 10.20mm, pristine and clean surface with mirror finish, hailing from off the coasts of Alghero, North-Western Sardinia, Mediterranean sea. I cannot emphasize enough that this untreated, not dyed and not polymers filled, oxblood color is rare and very difficult to get. Your search is over for fine, untreated astrological Jyotish, Vedic gemstones offered here at the most competitive prices for the quality in question. 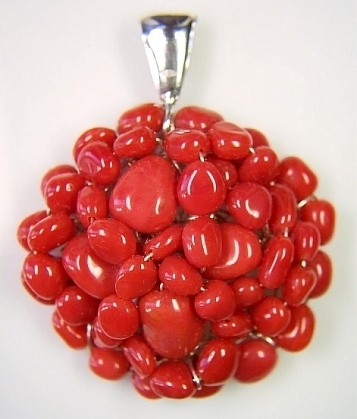 Absolutely magical, finest Italian make, untreated, Mediterranean red coral. 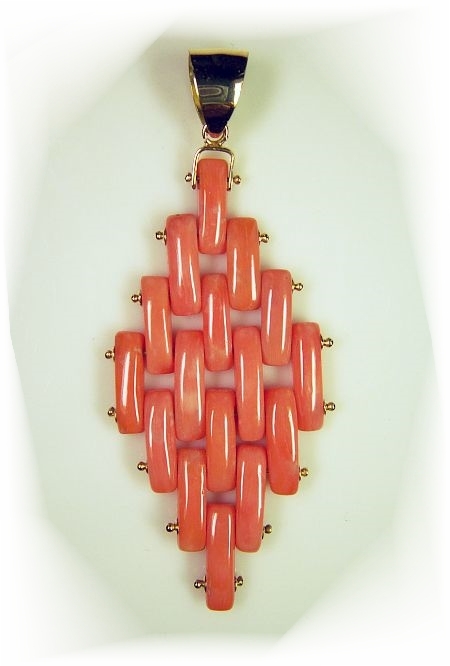 This is possibly one of those red coral pieces that are truly remarkable, and surely an one-of-a-kind. 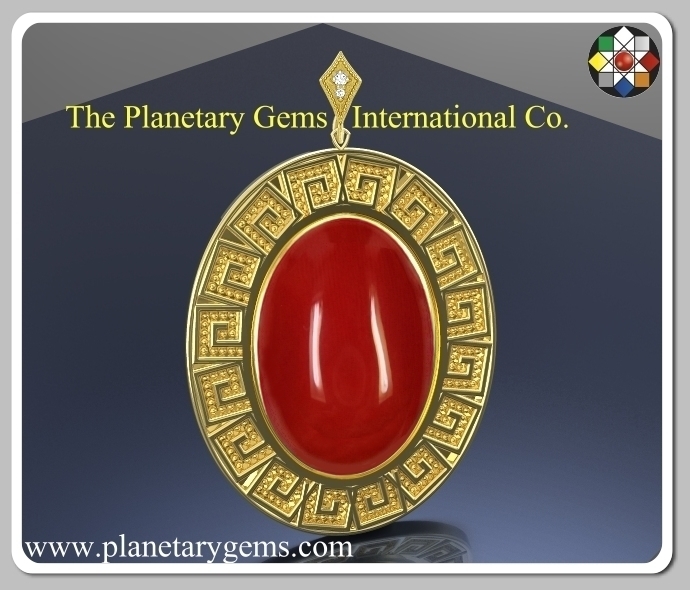 It weighs 6.28 cts, finest, "tomato" red color, one-of-a-kind, large cabochon cut with flat bottom, and measuring an incredible 16.8mm in diameter, superb Italian made and cut in Torre Del Greco (Italy), the coral itself originates from off the coasts of Tunisia, Mediterranean Sea. Clean surface and top mirror finish. It is not the carat weight that is important, most especially in corals, but the face or visual dimensions. A barrel cut of the same carat weight, less wide, because cut from the upper brunches of the marine coral tree, sell for much less than a piece like this, cut from the its trunk. This particular piece, very rare, absolutely gorgeous and for a very special person. 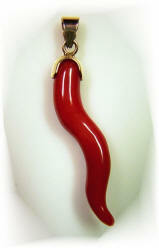 Very elegant & well crafted, 14KY gold, untreated, Mediterranean ox-blood coral pendant. I love this elegant pendant. 14K yellow gold, untreated, Mediterranean red coral pendant, the coral itself weighing 7.52 cts., fine oxblood red color, with good and clean, mirror finish surface, hailing from off the coasts of Alghero, Northwestern Sardinia, Mediterranean Sea. The pendant is 34mm long (including the bail) and 7mm wide, and the substantial and large bail will accommodate any size chain. You have to see this pendant in person. The long shape is so elegant and classy and wears very well, and the oxblood color is very rare to get. A beautiful and powerful combination for the unique you. 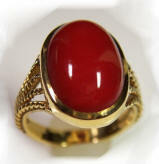 Marvelous & rare size, superb face, untreated, Mediterranean red coral. 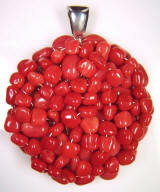 What a gorgeous, large, untreated, Mediterranean red coral. 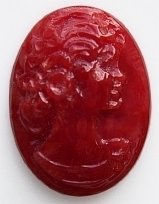 It weighs 10.27 cts., finest, tomato" red color to light ox-blood red, masterly fashioned in a flat bottom, cabochon cut, with a very large face for its carats weight, looking more like a 16-18 carats stone, and measuring 21 x 13.5mm, clean surface with mirror finish, from off the coasts of Southern Sardinia, Mediterranean sea. Gorgeous piece with a very large appearance that is guarantee to make a most unique ring or captivating pendant. Offered at a great price. Completely untreated, no dye, no polymer filling. 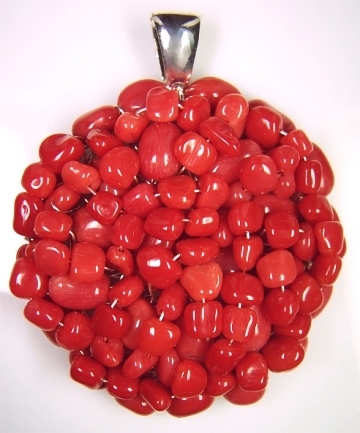 Very beautiful, awesomely shaped, untreated, Mediterranean red coral. 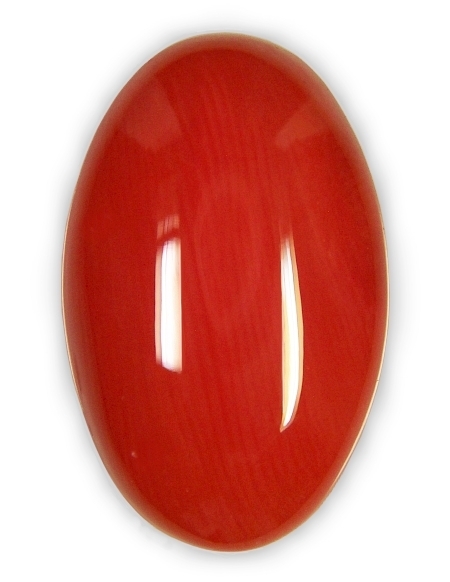 What a beautiful shape in this untreated, Mediterranean red coral. It weighs 5.86 cts., medium, ox-blood red color, well executed slender, elongated, oval cabochon shape, with flat bottom, measuring 22.5 x 9mm, good surface with top mirror finish, from off the coasts of Alghero, Northwester Sardinia, Mediterranean sea. 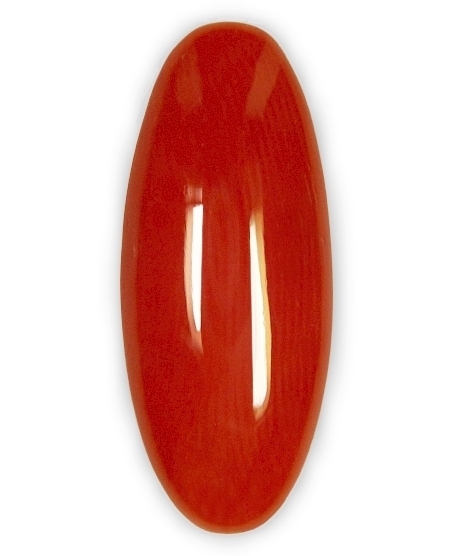 I love these long oval shapes in red coral. So elegant, unique, and when mounted so classy and eye catching. Either ring or pendant, this will make a super gorgeous Jyotish jewel to propitiate Mars. Offered at a great price. We are direct importers, so rest assured you will not find lower prices for such high quality. 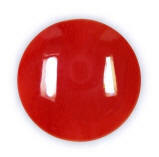 Great size, perfection, mirror finish, untreated, Mediterranean red coral cabochon. A charming natural, untreated, Mediterranean red coral, weighing 6.80 cts., rich, "tomato" red color, masterly executed, oval cabochon cut, and measuring 16 x 12mm, clean and pristine surface with mirror finish, from the coral banks off the coasts of southern Sardinia, Mediterranean Sea. 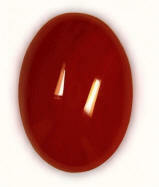 Great size, which is becoming hard to get nowadays in a perfect cabochon. The surface is flawless, with no imperfections, and the coral has been polished to a perfect mirror finish. Real nice, and guaranteed to attract the benevolence of Mars. 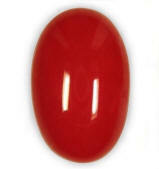 Delightful, great size and perfect, untreated, Mediterranean red coral cabochon. An enthralling, natural & untreated, Mediterranean red coral, weighing 6.10 cts., rich, "tomato" red color, masterly executed, oval cabochon cut, and measuring 15 x 10mm., clean and pristine surface with mirror finish, from the coral banks off the coasts of southern Sardinia, Mediterranean Sea. 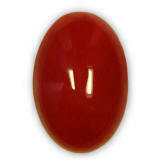 We are the source for Jyotish quality red corals at the lowest wholesale prices. We carry strictly untreated, not dyed and no polymer filled, Mediterranean and Japanese red corals. We meticulously choose only the most perfect, unblemished pieces, paired by perfect cutting and high mirror finish, destined to propitiate and sustained the power of Mars in the native's life. 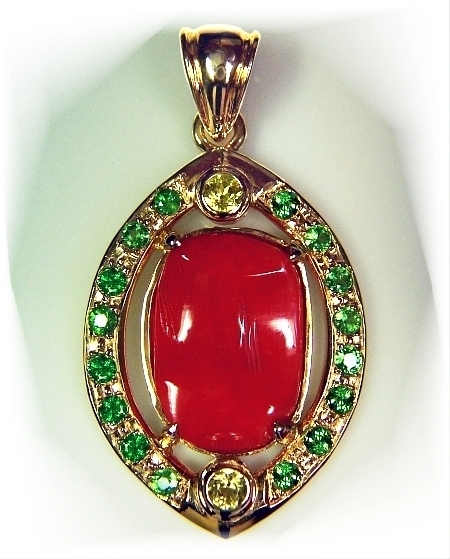 One-of-a-kind, Italian made , 14K yellow gold, Italian red coral pendant with tsavorites and Mali garnets. 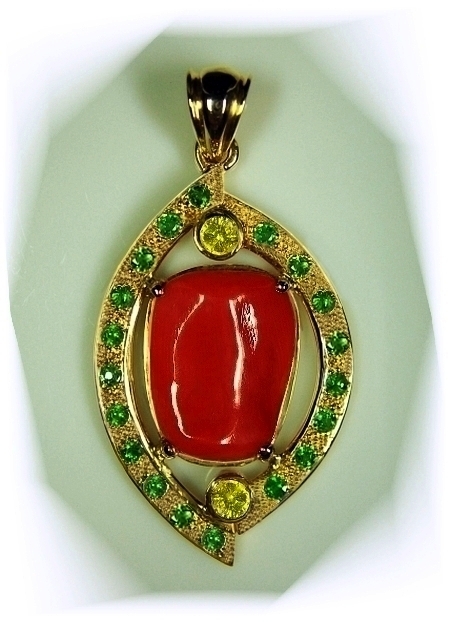 A most unique, perfectly hand crafted, 14 yellow gold, Mediterranean red coral, accented with Mali garnets and tsavorite garnets, 4.36 grams of gold, the untreated, Sardinian baroque coral shape weighs 4.93 cts., measuring 18.78 x 11.72 x 4.3mm, with 1.39 cts. total weight the 16 tsavorites and 4 Mali garnets, all eye flawless and lustrous. It is a large and solid, I would say a masculine pendant, even though it is also appealing to a female audience, measuring 1.5" long and 13/16" in width. 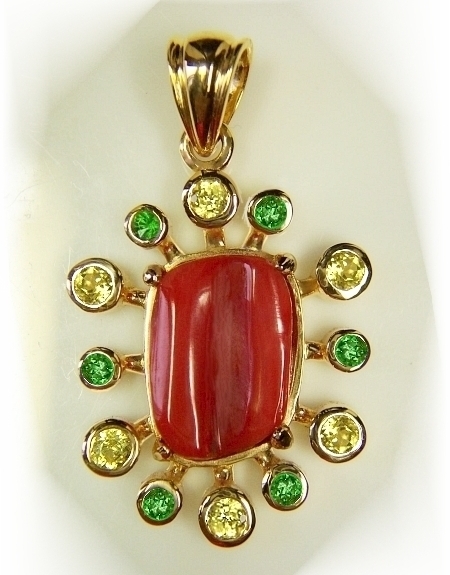 Needless to say, this gorgeous, unique designer pendant is offered at a very low price. All natural, not treated material. Great for both male & female alike. 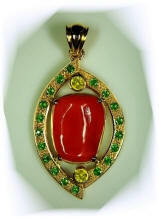 One-of-a-kind, gorgeous, 14K yellow gold, Italian red coral pendant with tsavorites and Mali garnets. A most beautiful, perfectly hand crafted, 14 yellow gold, Mediterranean red coral, accented with Mali garnets and tsavorites, 4.63 grams of gold, the untreated, Sardinian baroque coral shape, weighs 6.91 cts., measuring 18.35 x 14.10 x 4.1mm, with 1.36 cts. total weight the 19 tsavorites and 2 Mali garnets, all eye flawless and lustrous. 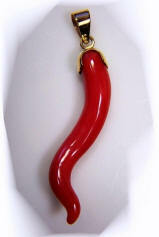 It is a very large and solid pendant, measuring 1 7/8" long and slightly over 1" in width. Needless to say, this gorgeous, unique designer pendant is offered at a very low price. All natural, not treated material. One-of-a-kind, 14KY gold crown with Mali garnets atop an untreated, Mediterranean coral "corno". Protective talisman. The corno or cornicello is an Italian amulet or talisman worn to protect against the evil eye (malocchio), and negative energies. 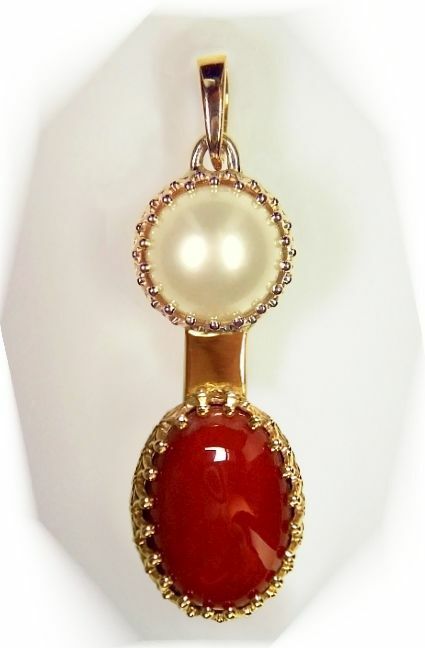 This 14K yellow gold pendant mounts an untreated, Mediterranean, naturally shaped, red coral corno (horn), , 6.65 carats the coral itself. ((3 more available at 6.30 cts., 5.67 cts. and 5.24 cts. same design)). The 14K yellow gold crown mounts four 4mm Mali garnets, pastel yellow-green color and have a total weight of 0.53 carats, and averagely the gold crown is 3.8 grams of 14K yellow gold. 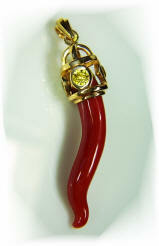 The pendant itself, including the bail is 45mm long. Set yourself apart. Really, really nice. One-of-a-kind, alluring, Italian made , 14K yellow gold, Italian red coral pendant with tsavorites and Mali garnets. 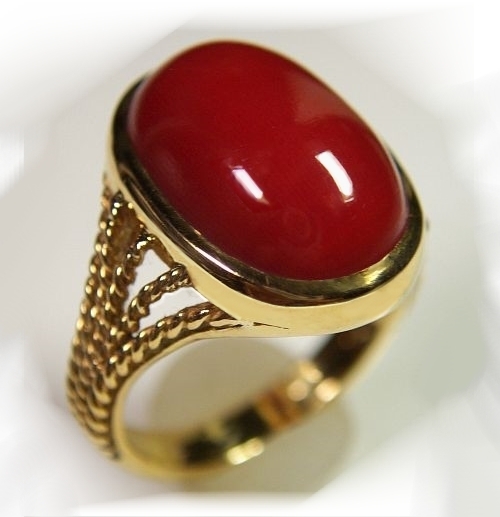 A most alluring, perfectly hand crafted, 14 yellow gold, Mediterranean red coral, accented with Mali garnets and tsavorites, 4.02 grams of gold, the untreated, Sardinian baroque coral shape, weighting 5.08 cts., measuring 16.70 x 11.74 x 3.5mm, with 1.14 cts. total weight the 16 tsavorites and 2 Mali garnets, all eye flawless and lustrous. 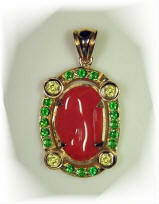 It is a very large and solid pendant, measuring 1.5" long and 7/8" in width. Perfection, affordable due to size, untreated, finest Mediterranean oxblood red coral. 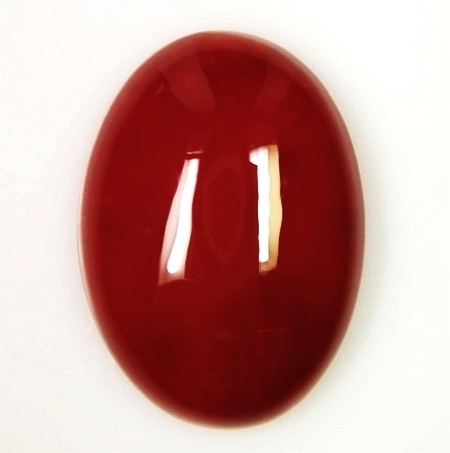 Truly a lovely, untreated ox-blood red coral, weighing 2.70 cts., finest ox-blood red color, perfectly executed, oval cabochon, and measuring 11.89 x 8.10mm, clean surface with mirror finish, hailing from off the coasts of Alghero, North-Western Sardinia, Mediterranean sea. For being truthful, we say this is Mediterranean, even though we suspect to be of Japanese origin. Our Italian supplier imports corals from all over the world, then work all this rough locally, just south of Naples. Mixing the parcel according to color and quality is at this point done, and given not really importance to provenance. Wherever this is hailing from, a fine and affordable piece of true ox-blood. 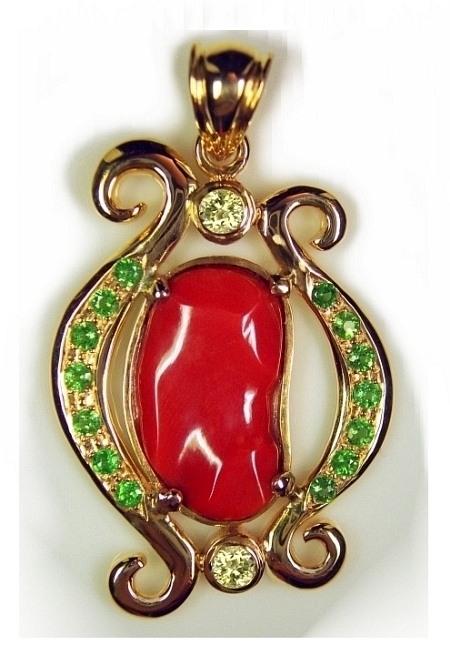 One-of-a-kind, magical, 14K yellow gold, Italian red coral pendant with tsavorites and Mali garnets. Exuding magic in an unique arrangement, this perfectly hand-crafted ,14KY gold, untreated, Sardinian red coral and garnets pendant, weighting 3.85 grams in gold, the Mediterranean coral itself weighing 4.06 cts., untreated (not dyed, not polymer filled) ox-blood red color, very rare nowadays, free form cabochon, measuring 12.30 x 12.68 x 4.00mm. There are 14 untreated garnets, 2 Mali and 12 Kenyan tsavorites for a total of 1.1 carats. 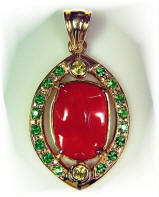 The pendant is 35.5mm in length including the bail, and 23.5mm large. If you are looking for something unique, completely natural, and one-of-a-kind jewel, this is the one for you. Great price here. Very fine, unique, red coral flower carving, one-of-a-kind because of its huge size and uniqueness. 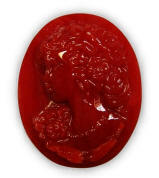 It weights 13.10 ct., medium, ox-blood, red color, excellent carving details,, 18x15mm, smooth finish and texture. Rare all the way. In a huge parcel from a "corallaro" in Torre Del Greco, Italy, saw just this only heart shape. 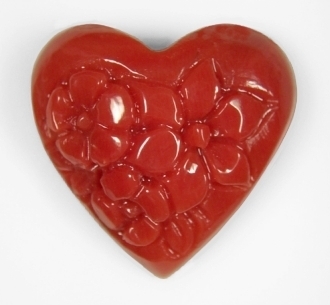 This is truly a one-of-a-kind, heart carving, with beautiful texture, excellent proportions and huge, hard-to-get size, and priced well for its make. Anyway, priceless that is. Sensuous, slender shape, untreated, Mediterranean Sardinian ox-blood coral. Gorgeous. 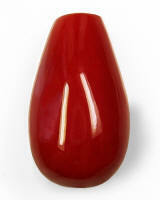 Gorgeously cut, with a slender and unique shape, this Mediterranean, Italian red coral weights 6.11 cts., fine ox-blood red color, slightly elongated, oval cabochon cut, measuring 18 x 10mm, fine clean surface with mirror finish, from the coral banks off the coasts of southern Sardinia, Mediterranean Sea. Beautiful ox-blood coral that will mount perfectly in a ring. 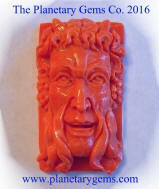 Ask for your personalized and costumed, astrological, Mars talisman. And set yourself apart. 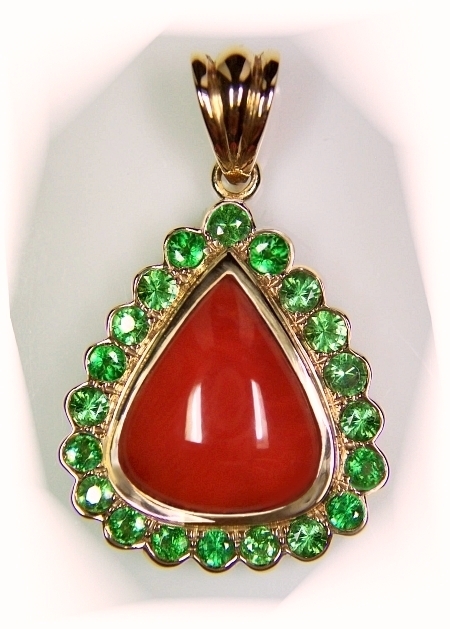 A very beautiful, solidly well crafted & utterly unique, Italian red coral and tsavorite garnets pendant, mounting a center, bezel set, untreated, Mediterranean red coral, weighting 3.56 cts., medium-light, ox-blood red color, excellent, drop shape cabochon with flat bottom, and measuring 13x11mm, good surface and polish. 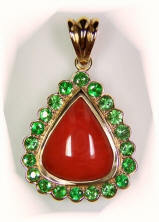 Around the perimeter of coral, bead set, there are 20 pcs of untreated, Kenyan tsavorite garnets, approx. 1.75 cts. total, 2.3-2.5mm rounds, all eye clean and with a vibrant, medium, "fern" green color. Striking eye appeal in a well balanced combinations of colors. The pendant measures approx. 30mm (including the bail) in length and x 20mm wide. Really very nice. 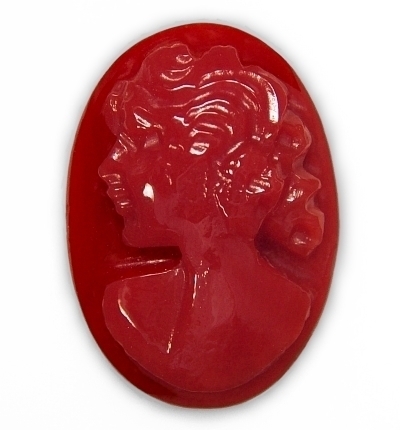 What an unique red coral carving. None like it. This Sardinian ox-blood coral carving weights a great 27.64 carats total, fine ox-blood red color, perfect texture and finish for a carving, it measures 19 x 12 x 7.5mm, needless to say hand carved to perfection by a master incisore of Torre Del Greco, Italy. Use it for an unique pendant/brooch or ad it to your collection, this is simply a piece of art. Priceless. Hard-to-get quality. During our last trip to Torre Del Greco, we picked only one piece (with the nicest color) of these gorgeous coral cameos. This weights 5.38 cts., finest, ox-blood red color (completely untreated, not dyed), 12x16mm calibrated oval cabochon with exquisite carving details. (pic is larger than actual piece...please, refer to dimensions in mm). Coral is from Sardinia, Mediterranean sea and engraved in Torre Del Greco, Italy. Nowadays, only a handful of "incisori" (literally "engravers") in Torre Del Greco, are still working the coral this way. It is an art that has been passed down from father-to-son for centuries, but destined, unfortunately, to disappear. This is a great, rare example of wearable art that is sure to please and uplift the spirit! We love these red coral pendants. And they are completely natural. Very unique and of conspicuous size, this 14K yellow gold pendant red coral "corno" weights 9.93 cts. total weight (the red coral itself weights 8.16 cts. ), 1 5/8" long (including the bail) or 44mm, featuring a free form, untreated (not dyed and not polymer filled) ox-blood coral, with clean surface and fine high polish surface, hailing from off the coast of Western Sardinia (Alghero), Mediterranean Sea. We picked the very best and of great size from a huge parcel. Rest assured these are the best available, and simply wear unique, exotic and captivating. Great gift for yourself or your loved one. 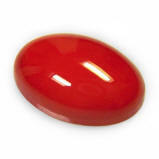 Like with every other gemstones we stock, we cherry pic the nicest, flawless, completely untreated, ( which means natural in color and without polymer filling), ox-blood Mediterranean & Japanese corals. Coral comes in many color shades, from white to light and medium pink, pink-orange, light orange, orange, reddish orange, red, maroon red and black. The main, worldwide trade & production center for coral is Torre Del Greco, Italy. In this sunny little town, just south of Naples, rough coral is imported from everywhere and worked locally by small family enterprises. High quality bead strands, cabochons, carvings, free forms, etc. are thus produced to be sold to designers and jewelry manufactures all over the world. ((This is the finest, Italian designed & manufactured quality and not readily available)). The rest of lower quality rough, is sold to India & China. Both countries are very avid buyer of coral. In India and China, coral will be shaped mostly in barrel and triangular shapes. And all of it, will undergo treatments, both in dyed form and polymer filling to conceal cracks and imperfections, which is very common in natural coral. In all, Beware of Indian and Chinese coral. 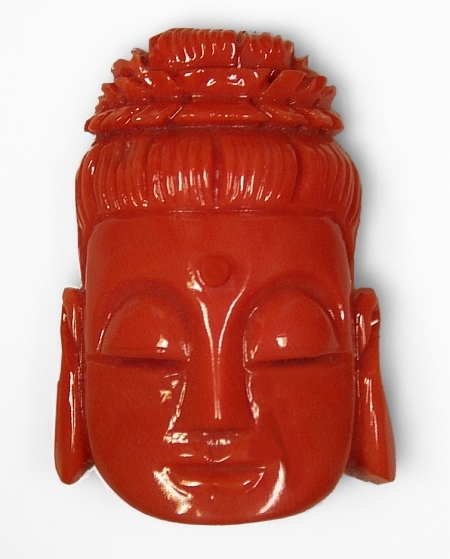 An one-of-a-kind, spiritually compelling, coral "Buddha head" carving, weighting a great 35.72 cts., medium "flame" orange color, very slightly pinkish in undertone, measuring approx. 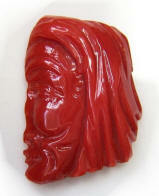 26 x 19 x 11mm, Pacific origin., with excellent carving details, clean surface and fine polish. Carved in Torre Del Greco, Italy. This is from the 2015 trip to the "coral capital of the world". An absolutely, spiritually unique, Pacific coral carving, with fine details and with an overall, awesome feel to it. Certainly to make a bespoke, one-of-a-kind pendant or just add it to your existing collection as it is. Astrological pendant talismans for Vedic red corals. Set yourself apart. Our ultimate goal is to create powerful, well balanced & beautiful talismans for Vedic astrology & healing. What about this "Greek" inspired pendant? All of our talismans are hand crafted to perfection, and we always strive to give everyone something that is personalized & unique. Every custom piece, even though follows the main design, will have invariably something unique & different from the previous (be size of granulation, slightly different spacing, 1 tier or two tiers around center gem, etc.). Can do it in either yellow or rose gold. And we can do it for any size coral. Set your self apart.